Last week we opened up the Nintendo Life Game of the Year 2011 Readers' Vote, giving you the opportunity to commemorate the very best titles of the past 12 months. 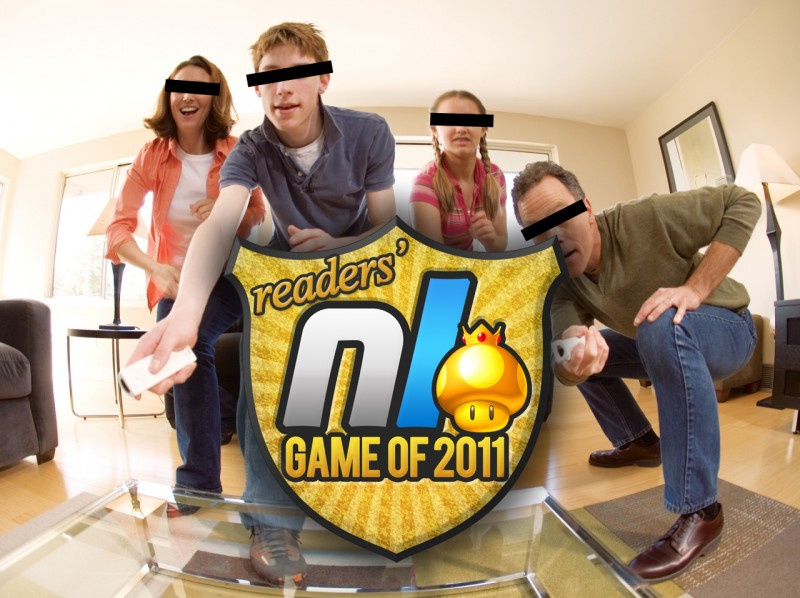 We received over 6,000 votes over the course of a week, and after stringent verification we've tallied them all up to reveal the games you voted as the best of 2011. An absolute landslide in Link's favour, mopping up nearly three-quarters of the vote, Skyward Sword also grabbed the coveted Nintendo Life Wii Game of the Year. An adventure of inimitable spirit and imagination, this was clearly worth the five year wait, and the year's best argument for motion controls. The monster-battling phenomenon took to DS again in 2011 with its best instalment yet. The fact you only see new Pokémon in the story mode was a fantastic move to recreate the sense of wonder trainers felt in their first adventure, and enhanced online trade and battle features were most welcome. Fending off the off-road advances of his kart-based rival, Super Mario 3D Land showed that when it comes to portable platforming, the plumber is king. A free multiplayer Zelda game was always going to win this award, but its margin of victory is almost embarrassing. It's only free until 27th February, so if you haven't downloaded it yet make sure you don't miss out. Another runaway winner, Intelligent Systems' blocky puzzler is equal parts clever, cute and downright fiendish sometimes. Throw in a level editor that lets you share your creations online and you've got the complete package. A deserving victor. RedLynx's MotoHeroz proves that there is room for quality on WiiWare, and that players are willing to pay for it. The daily race challenges provided one of the best reasons to keep powering up your Wii in 2011, providing more value for money than most cheaper WiiWare games — or even disc releases. These are almost the same ones I gave my vote. Only 3DS winner is different. I voted for Mario Kart 7. WOW! Everything I voted got 1st place! Nice! Wait, isn't there an official GoTY, with IGN hosting, or something????? Help, please! Americans will get their chance to vote Xenoblade as 'Wii game of 2012'..
Skyward Sword is mediocre. Have people played the other games that came out? Skyward Sword really isn't mediocre. It's Super. I voted Zelda for Wii, Kirby for DS, Mario 3D Land for 3DS, Four Swords for DSiWare and Pullblox for 3DSWare. Nearly everything turned out as I expected. But it's weird dat 3D Land is the best 3DS game and Mario Kart 7 is second best game of the year. I also agree with Kirby97. Ghost Trick deserved a place. Well, It was a really good Nintendo year.! Hope next year will be good too. Happy New Year!!! Awesome list, but where is the love for SolatoRobo? I'm really happy Xenoblade got second despite the fact that the Americans are yet to pay it. In my opinion it pretty much matches Skyward Sword overall, and is well deserving of it's 2nd place. Also, I was surprised that Super Mario 3D Land got 3DS game of the year. I thought it would be MK7. Awesome, Pokemon getting first, the best 300 hours of my life. Shame VVVVVV didn't win, even though Pushmo is fun. I'm surprised that OoT 3D didn't win in the 3DS GoTY, however I am glad that it was beat by 2 fine games, Mario Kart 7 and Super Mario 3D Land. None of my choices won but four swords but these are well deserving. But I will wait for that year when Professor Layton beats Pokemon. Basically what I voted for as well. It was a really good year after all. @Dragoon: It didn't have a real chance since it's only out in the US! Where's my eShop love for Freakyforms?! I demand a recount! =) Really was the wuhu loop glitch was enough to keep mario kart 7 from winning 3DS GOTY? Everything I voted for, except 3DS game of the year, won! Awesome! Zelda definitely deserved everything it won today and yesterday. It was a great year to be a Zelda fan. This really is a sad state of affairs for Wii this year, isn't it (especially in North America)? The fact that Kirby got 3rd place is telling. I'm sure Pokemon would've been my DS GotY if I had gotten it (since I didn't play any DS games from 2011), but I just couldn't let myself get into that series again. I really just don't have the time these days. Glad Mario Kart 7 was beat by 3D Land, in 3DS GotY at least. For me, mind-blowing creativity and pitch-perfect platforming will beat fun multiplayer racing any day. Not too surprised my vote for Flipper 2 didn't go anywhere considering it's been out for only 49 hours in EU and not in NA yet at all. I made a good call in voting for VVVVVV instead of Pushmo, as I knew the latter would win due to VVVVVV being out for the same amount of time as Flipper 2, and only in one country again (this time America). Especially since while Pushmo might be the best puzzle game I've ever played (besides the Portal games, which have so much else going for them anyway), VVVVVV is hands down my favorite "traditional" platformer, and I like platformers better than puzzlers. I should be happy my FLUX vote counted for something in it getting third place, and I am, but really, it got beat by FAST? This series really is too eclectic for the majority of gamers. No surprises with the "Ultimate" GotY, but as others have said, interesting Mario Kart 7 took the cake over 3D Land for this award. Maybe people who voted the latter as 3DS GotY felt bad and wanted to give Kart some love too? Zelda: Skyward Sword is one of the best games that has ever been made and will ever be made, so kudos to Nintendo for proving they still have what it takes to be the best after 25 years. @Mahe Dood, (in America at least) nothing else came out. Even if Skyward Sword was mediocre it'd still be the best Wii game released this year. Kirby getting 3rd place is WHAT? Is it wrong I prefer Kirby over Skyward Sword (despite loving both). You don't speak for all of us man. Hell I even like Fortune Street after it. Rayman Origins not so much. It seemed to be a slow year at the beginning for Nintendo, with the botched 3DS release and all but towards the end they put out some good games indeed and salvaged the year. Kirbys Return to Dreamland, Skyward Sword, SM3DL and MK7 just to name a few. Hopefully 2012 they will have a good year all around. This was to be expected, and for good reasons, too. @KaiserGX I know, I'm as much at fault as making my opinion sound definitive as anybody else, but that's just my opinion. I was hoping for Carmen Sandiego and Excite Bike. Everything else I voted for. Really dont think Pokemon deserves first - that franchise is just getting lazy. All the others were the same as the staff ones, and were pretty obvious choices. I really wish Okamiden and escapeVektor Chapter 1 had won at least an honorable mention... those games really made 2011 for me in terms of gaming. I like this concept, because the fans can't complain. We did the voting, and this shows what the majority of us liked. Though I think if more people would try more games, the votes might not be so landslide-ish all the time. Ah Xenoblade, how I wish I could have played you in 2011! Well 2012 will be the year I play then, and April isn't too far off! I've only really played 4 of the winning games so i better keep my mouth shut about the winners. But Kirby Mass Attack, Mario Kart 7 and Pullblox are really great. Zelda OoT was nice too but i can't really get excited about a remake of a game i played before. One to Watch in 2012: Looking forward the most to Luigi's Mansion 2. Of course i hope Kid Icarus: Uprising to turn out great but i don't wanna get my hopes up too high for this one. Fanboy moment: The update that contained video recording. Especially being able to pay for just one eShop game was something i never thought i'd ever see. Along with the very Nintendo-like updates to StreetPass this makes me more optimistic that Nintendo really grasps online now. PS: It would be interesting to see a full list of the eShop results. I thought Pushmo would get a much bigger advantage. So pretty much the same except for the DS section. Yeah, no surprises here. It's a testament to what a sneaky good year the old DS had that none of my four favorite 2011 DS games (Radiant Historia, Ghost Trick, Okamiden, Solatorobo) cracked the top three in votes and I don't have a problem with it. @cyrus_zuo Hey, I really enjoyed both of them, and First Flight was actually the best DSiWare game I played this year (besides Antipole, but I think I'll give Airport Mania the edge). Sorry I didn't vote for it on the assumption that my DSiWare GotY was going to come out yesterday, which it didn't. On an unrelated note, do you have the power to put Airport Mania on sale on the Amazon App Store so I could get it for my Kindle Fire? I think I would enjoy it even more on the bigger, full-touch screen. BRING ON 3DS RUBY/SAPPHIRE REMAKES!!!!! Yeah!All the games I voted for, got the 1st place! Well...except the DS game I voted on Solatorobo.But doesn't matter they're all great games! !XD Happy new year everyone! I voted mario kart 7 for 3DS game of the year but it wasn't. arrrrghhh! Very little of what I voted for won. Not too surprising, considering I voted Radiant Historia for DS game of the year (Yes, it was better than Ghost Trick and Solatorobo, at least in my opinion.) and Step Up! for WiiWare, since I don't own any Wiiware titles. Though I will need to check out FAST. Didn't get too vote because I was banned at the time.. disappointing. Ocarina of Time 3D deserved 3DS Game of the year though. NOOOOOOOOOO!!!!!!!! OoT 3D disn't get GOTY!!!!! Zelda Skyward and Kirby Dremland, my year favorites. ARE IN! Sweet! I voted Mario 3D Land as 3DS GOTY, and MarioKart 7 as overall GOTY, and MK7 beat out 3D Land by a hair in the runner up tallies for overall GOTY. I guess I made up one of those handfuls of votes that edged MK7 into the runner up spot. Skyward Sword also had my vote for Wii. PS - Hooray for Pushmo! @kesley You should check out BIT.TRIP FLUX. Mario Kart 3DS should have beaten Mario 3D Land. Also it's a shame Skyward Sword beat Xenoblade Chronicles by such a large margin. I preferred the latter game. 4 swords in single player would not be good enough to win. Since Xmas however I've had the privilege to play it multiplayer, it is an absoloute blast, all makes sense now. The first 8 worlds of 3d land are fairly easy, but then the specials are much more of a challenge, good mix imo. But what about Ghost Trick! Noooooo! So much first party Nintendo its sickening.